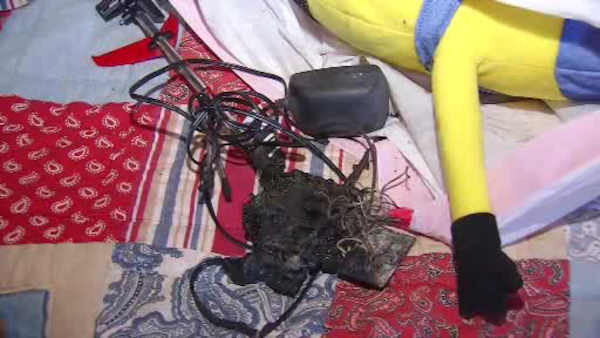 BRICK, New Jersey (WABC) -- A boy at the Jersey Shore woke up to an alarming sight: his toy helicopter melted into his desk. He left it plugged in and charging on the floor near his bed. Now he and his family are thankful something worse didn't happen. The Thanels were all sound asleep one night about a week ago, while a danger was smoldering in 10-year-old Daniel's room. It wasn't even noticed until morning. "Knocked on his door to wake him up, he came out with a shocked look on his face said his helicopter melted," sand Daniel's father Robert Thanel. "I just looked on my desk and saw a melting hot helicopter, it was popping," said Daniel. "I ran over and unplugged it and then a battery made a big popping noise and stuff dripped." Robert made sure the smoke detector in Daniel's room was working. It was. It never tripped. The family says the helicopter, a remote control 'Tough Copter' toy, was charging overnight on their son's desk when something went wrong. "The heat it produced with the proximity to everything around here, it must have put out a lot of heat, it must have been on fire at some point," Robert said. The remote control identifies the company that makes the Tough Copter as Protocol. Thanel says he took the toy back to the electronics store where he bought it, and was given just an email address to Protocol. "I gave them a lengthy email, polite, but nothing came back," he said. The fire has the family making a big change. "I make sure the lamps are shut off, nothing is running, all my iPads are not plugged in, because I don't trust it," said Daniel. Also, it's not lost on them that just above that obviously hot smolder was a Christ statue right above it. They're putting out the warning. "This was lucky, it could have been 100 times worse," said Robert.